Not much time on the clock but wanting a slice of the hottest corner of Europe right now? Hello Adriatic Horizons. 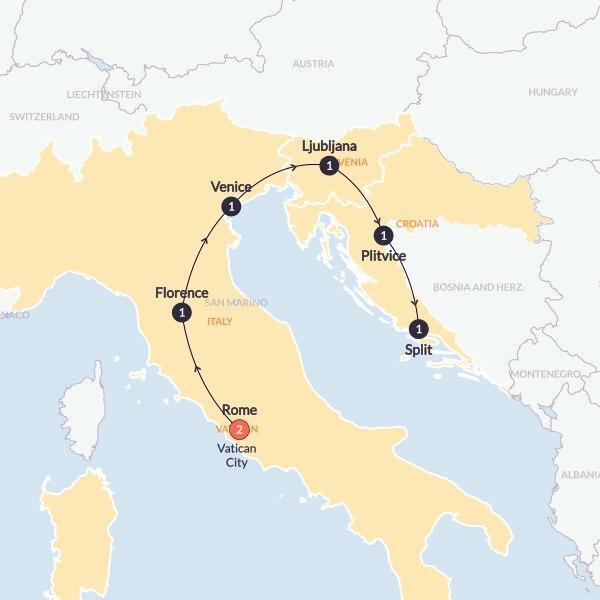 Visiting the big sights of Italy, then taking it down into the more remote spots of Slovenia and Croatia, this trip is perfect for those wanting to tick some serious boxes in just over a week. From walking in the footsteps of ancient Romans, to soaking up the vibes at the Instagram-worthy Plitvice Lakes, this each day is different, and down right amazing. Fuel up for days of exploring with delicious fresh breakfast daily. We'll also throw in 2 dinners as part of the deal, designed to get your tastebuds tingling with local faves. All other meals are there for you to roam free, follow your nose to where the locals hang out for even more unique tastes.